Mark Twain once co-authored a play with another forgotten writer named Bret Harte. Their legendary meeting was even depicted in an advertisement for Old Crow whiskey (above). Here’s how Twain himself described it. 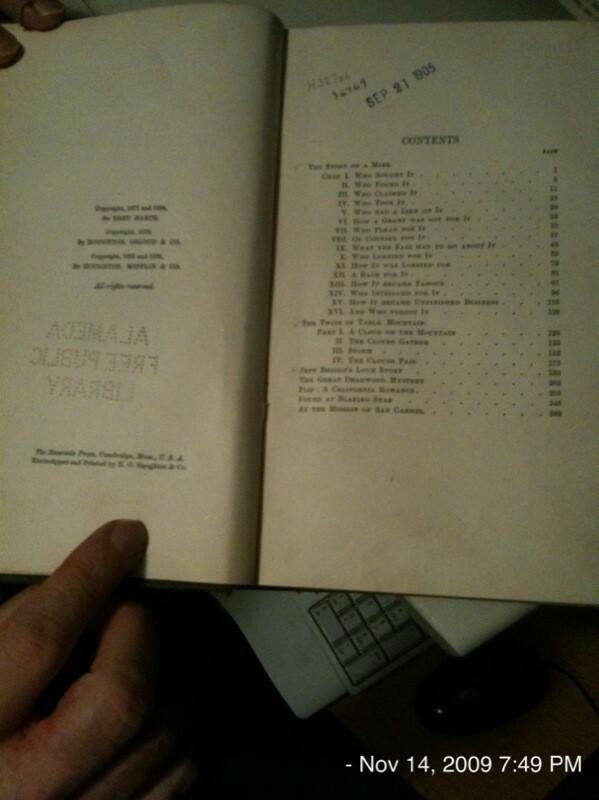 So last year I’d finally pulled down a dusty volume of Bret Harte stories from my local public library. I’d had an emotional reaction to “The Outcasts of Poker Flats” — and an equally intense response to “The Luck of Roaring Camp.” But Harte’s career had peaked early, and it seems like he spent his remaining decades just trying to recapture his early success. (“His last letters are full of his worries over money,” notes The Anthology of American Literature, along with “self-pitying complaints about his health, and a grieving awareness of a wasted talent.”) Even in the 20th century, his earliest stories still remained popular as a source of frontier fiction — several were later adapted into western movies. But Harte never really achieved a hallowed place at the top of the literary canon. Yet “The Luck of Roaring Camp” was the first ebook I’d ordered on my Kindle. I’d checked for print editions but hadn’t found a single one at either Borders, Barnes and Noble, or a local chain called Bookstores, Inc. Days later, I’d decided to try my public library, where I discovered a whole shelf of the overlooked novelist (including an obscure later novel called The Story of a Mine). 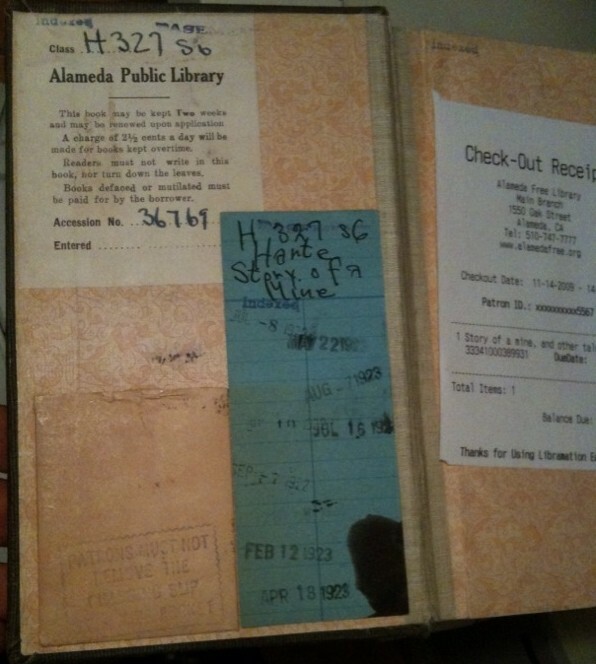 And that’s when I noticed the date that the library had stamped on its inside cover. If you haven’t been introduced to Manybooks.net (http://manybooks.net/) I would like to mention it. Many of Bret Harte’s (and Mark Twain’s, and Charles Dickens’) works are available there for free. Manybooks takes books from the Gutenberg Project (books that have gone out of copyright and have been transcribed by volunteers) formats them more nicely (turns .txt files into mobi, epub, lit or any of a dozen other formats including custom pdf) and allows the would-be reader to search and download for free. You can download them to your computer and use the USB cord to load them on the Kindle.